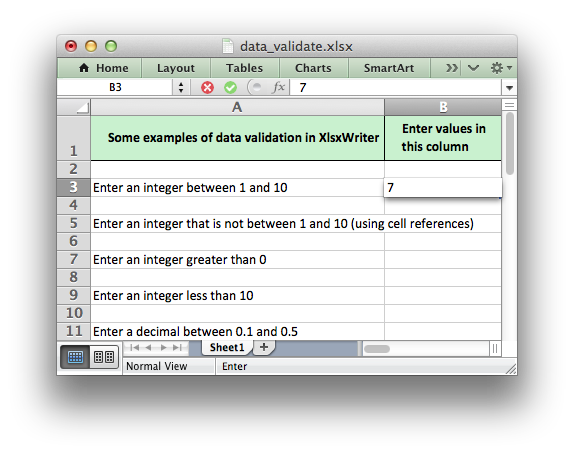 Example of how to add data validation and drop down lists to an XlsxWriter file. Data validation is a way of limiting user input to certain ranges or to allow a selection from a drop down list. # a drop down list. # Add a format for the header cells. # Set up layout of the worksheet. # Write the header cells and some data that will be used in the examples. # Example 1. Limiting input to an integer in a fixed range. # Example 2. Limiting input to an integer outside a fixed range. # Example 3. Limiting input to an integer greater than a fixed value. # Example 4. Limiting input to an integer less than a fixed value. # Example 5. Limiting input to a decimal in a fixed range. # Example 6. Limiting input to a value in a dropdown list. # Example 7. Limiting input to a value in a dropdown list. # Example 8. Limiting input to a date in a fixed range. # Example 9. Limiting input to a time in a fixed range. # Example 10. Limiting input to a string greater than a fixed length. # Example 11. Limiting input based on a formula. # Example 12. Displaying and modifying data validation messages. # Example 13. Displaying and modifying data validation messages. txt = "Display a custom error message when integer isn't between 1 and 100"
# Example 14. Displaying and modifying data validation messages. txt = "Display a custom info message when integer isn't between 1 and 100"